Have questions? Discuss this Web Development tutorial with others on the forums. 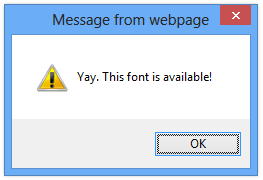 // Call this function and pass in the name of the font you want to check for availability. That's all there is to it. You can see a fully working example at the Does This Font Exist page - the same one the above example is based on. As you can see, our code itself is pretty simple. You just need to know how to do some basic things with the HTML5 Canvas API. What may be less simple is the madness that our code represents and how it helps you figure out whether a font is available or not. The way our code works is by taking advantage of the Canvas element and the APIs it provides for drawing and measuring the size of what you draw. First, I virtually draw two pieces of text. Next, I check whether the sizes stored in baselineSize and newSize are the same or different. Now, why would I do this? If the Corbel font exists on your system, then drawing some text using it will display using that font itself. This means that it has a size that depends on the parameters unique to Corbel. Similarly, your monospace text will display using a size that corresponds to the default monospace font used. You will have two pieces of text displayed at the exact same pixel size. That is a dead giveaway that the font you are curious about doesn't exist and the fallback font monospace font is being used instead. The only time you may get a false negative is when you actually specify a monospace font like Courier New or Consolas that is also set as the default monospace font for your browser. In such cases, your font will exist but it will also display in the same size as the text specified to display only as monospace. Using our current logic, this means that despite your font existing, the code will tell you otherwise. I don't envision these situations being too common, but do look out for that case. Well, that's all there is to this little deconstruction that shows how you can use the Canvas APIs to figure out whether a font is available for your browser to use. Canvas is part of the HTML5 bucket of new things, so older IE browsers will not support it. If you care about the elderly (browsers), look into using the excellent explorercanvas library to bring the joys of Canvas to a larger audience unwilling or unable to upgrade to a modern browser.